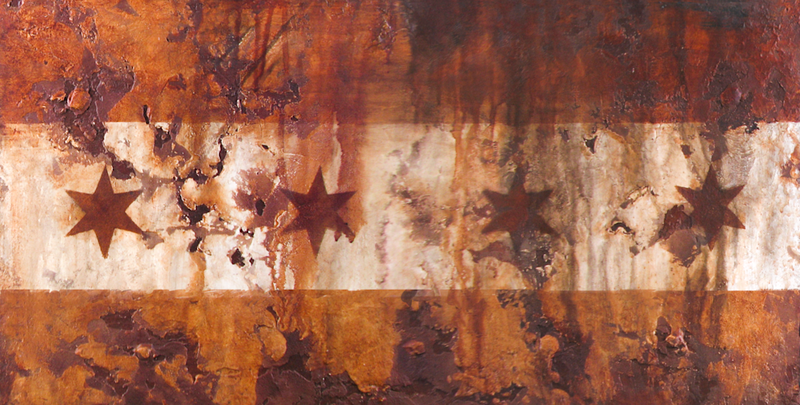 Strong vertical texture on canvas shows off the shimmery and matte variations in texture in this rusty panorama of the Chicago skyline as seen from Buckingham Fountain. A recycled canvas gets a new life showing off some major texture. Check out the back - despite being stabbed by a plumbing pipe this canvas lives on. This city will give you a hard time, once it gives you a few scars you know you belong! Chicago's skyline channels the drips of rusty water. It's all glamor and shimmer... with a little grit & grime thrown in to keep you on your toes. Our beautiful Chicago, with all its rust & grime. Some cities are built on Rock 'n' Roll. Well, it's here, of course - most things are, but it was built on the backs of immigrants, risk, hopes, dreams, greed, corruption, sparkles, politics... different rocks and rolls. This is a stretched canvas, saved from a stabbing by a plumbing pipe. Resurrected with some burlap and a bunch of texture, brought to life again with rusty grit & shimmery metallics.